Soft and absorbent , this bib is perfect for the next generation of NASA Space explorers! 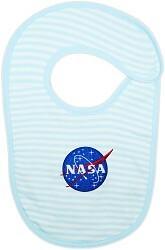 100% cotton bib will help protect your baby's clothing from drool and spills. One size fits most babies 0-24 months.